Celia Perez and I made 24-hour zines (actually 12-hour zines) for International Zine Month and because it was something fun to do together while she was visiting NYC. 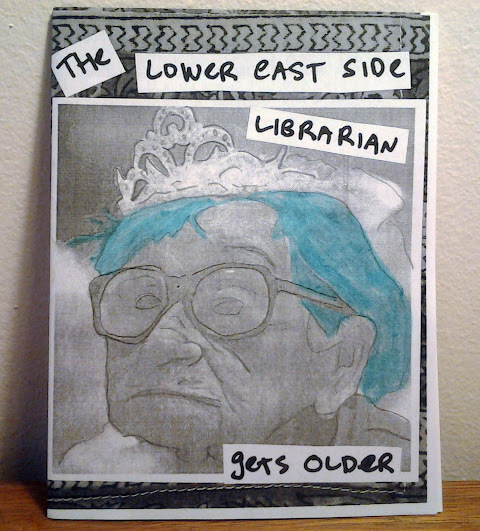 It also allowed us to have something new to bring to Pete's Mini Zine Fest the next day. My zine is above. I only made 15 copies, and I'm not sure I'll make more. It has lots of typos, and the margins are an embarrassment to any experienced zine publisher. But the real reason that I don't think I'll put it into wide circulation is that it's very rough and personal. It's like an unauthorized autobiography of some of my most troubling fears and self-doubts. I will consider offering the few copies I have left as trades, or as gifts to close friends.